Ultraviolet Light UV Toothbrush Sanitizer - Does It Work? Ultraviolet Light UV Toothbrush Sanitizer – Does It Work? UV sanitizer (sometimes called also UV sterilizer) is a device that uses ultraviolet (UV) light to kill microorganisms. 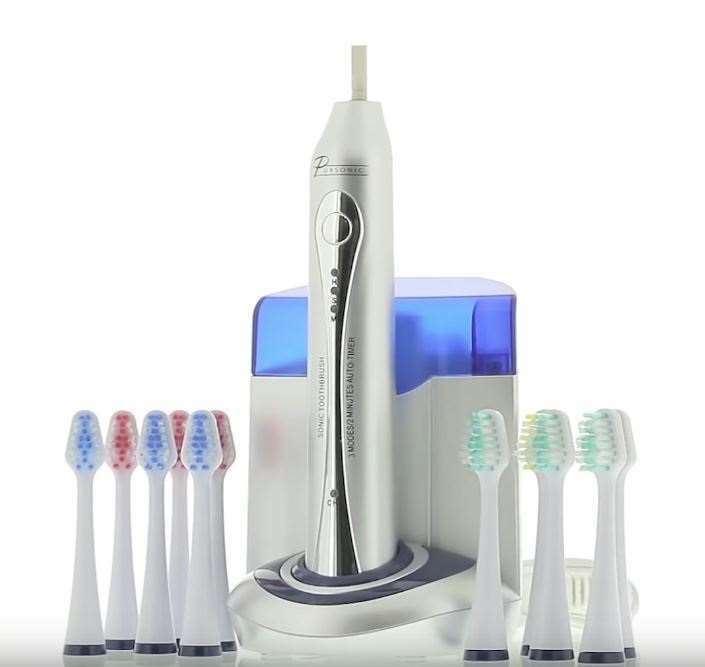 Toothbrush sanitizer is a type of UV sterilizers designed specifically for electric (or manual) brushes, and it destroys bacteria, viruses, and molds that can be present on the brush head. UV light kills some microorganisms and makes others unable to reproduce. UV light is also used to sterilize medical equipment, food, water, and air. Toothbrush UV sanitizer is used for sterilizing toothbrush heads. Toothbrushes and brush heads can also be stored in sanitizer. There are several types of sanitizers – for electric toothbrushes, manual brushes, and universal models. 1 Who Makes UV Sanitizers? 2 What About Oral B UV Sanitizer? 3 Which Toothbrush Heads Fit In Sanitizer? 4 Do I Need A Sanitizing Device For My Brush? 5 How To Use The Ultraviolet Sanitizer? There are several well-known manufacturers offering multiple counter-top and travel sterilizers. When I researched Ultraviolet sanitizers a couple years ago, the options were quite limited. 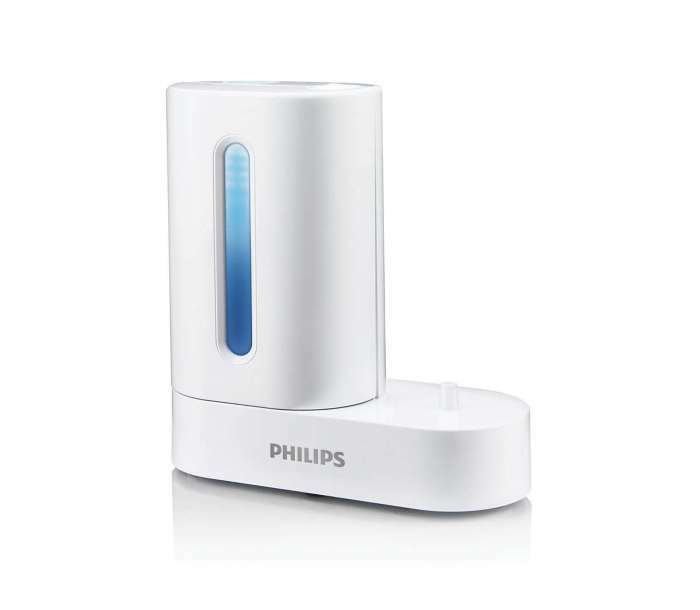 Philips offered Sonicare HX7990 sanitizer that was bundled with several power toothbrush models and also available separately. Lately, the situation has changed, and multiple options are available. Violight offers models for bathroom and travel. Violight has sanitizers not only for brushes but also for cell phones, razors, and mouth guards. What About Oral B UV Sanitizer? People are often asking us where to buy Oral b electric toothbrush with UV sanitizer. Here comes the bad news – OralB currently does not offer sanitizer with any Oral B toothbrush. Which Toothbrush Heads Fit In Sanitizer? Most manufacturers offer universal models. For example, Sonicare Sanitizer can be used for cleaning both Oral B and Philips replacement brush heads – Sonicare ProResults, Sonicare E-series, new DiamondClean heads, and also Oral-B Flexisoft and Oral-B Floss Action brush heads. Most models for manual toothbrushes can also sanitize heads of power brushes. Do I Need A Sanitizing Device For My Brush? It is essential to keep in mind that ultraviolet sanitizers do not kill all bacteria, so it does not make toothbrushes sterile. Also, keep in mind that not all bacteria are harmful. There are several pounds of good bacteria present in your body. There are several situations when this gadget will be very helpful. Use it if multiple people are using one electric brush handle with multiple brushheads. Sanitize your brush heads because bacteria can be transferred from the handle to the brush head. Use it if you have toilet combined with a bathroom. In this setup, there are always bacteria in the air and on surfaces. Use it if you are storing your manual or power tooth brush in a desk drawer in your office or glove compartment or your car. How To Use The Ultraviolet Sanitizer? After brushing your teeth, wash the brush head and shake it gently to remove the excess water. Put your finger on the door recess of the sanitizer, situated on the right side. Pull the door open. Insert the brush head inside the sanitizer. Place it in such a way that the bristles face the light bulb. Shut the sanitizer door properly. Otherwise, it will not work. Plug in the wire in a running power outlet. Press the ‘on’ button to kickstart the cleaning procedure. Do not place the travel cap over the brush head when it is being sanitized. To get the best results, check that the sanitization occurs for a full 10 minutes. If you want to stop the sanitization at any point, you can either press the ‘off’ button or propel the door open. To know whether the sanitizer is working or not, just look for a blue light glowing on the front of the window, and the gleaming of an LED screen. Once the process is complete, the LED turns solid green, and the device turns itself off automatically.